Series: Yes. Daughter of The Pirate King #1. Back when it was released, I’ve already had my eyes set on reading Daughter of The Pirate King. Without knowing much about it, I felt like it’s the kind of YA Fantasy book that I’d love: one with a good plot, a great and relevant theme, and, from what I’ve heard from my friends online, a stunning main character who’s strong, bold, and valiant. And I can’t believe it took me 10 months before I read it. (But then again, at least we’re only months away until the release of the sequel, right?) Read on for my review of Tricia Levenseller’s debut novel. It didn’t really take me long before I fell in love with Alosa, and her journey. From the very first chapter, I was easily allured by the story’s main character, and I constantly found myself completely wrapped up in her story. One of the main reasons as to why I couldn’t put this book down was because I wanted to see her plans through, and I wanted her to be as successful as she hoped she would be. Alosa is, as many of my friends have already mentioned, a strong, independent, and courageously valiant woman worthy being called a pirate (or a captain, whatever floats your boat). I also liked the variety of men / crew in the Night Farer and even after the story ended, I realized that I’m craving more background story behind some of them most especially Draxen and Riden, and Enwen. Yes, they stood in the way of Alosa and her scheme one too many times, but what I loved most about these men is their determination and perseverance in doing what they think is most beneficial for them and their crew. I found their attributes to be accurately depicted for pirates, and other than their wits, and their manly (stinky) odor, I feel like they’ll easily be recognized as pirates, thanks to the author’s imagination and creativity. I felt like the romance between Alosa and Riden started a little too early for my taste, and that somehow made me come up with a mindset that it was almost a form of insta-love (even if the loathing that they felt for each other was extremely evident from the start). Towards the ending, however, I did enjoy their tandem and this allowed me to ship them as the story ended. There were some parts that felt repetitive to me, and I know that this might seem a bit contradicting with what I mentioned about enjoying Alosa’s journey, but I just feel like the story could still be impressively written without some scenes that entirely felt unnecessary to me. And be sure to check out the sequel, Daughter of The Siren Queen come February 2018! Have YOU read the Daughter of The Pirate King? How was it for you? And are you also anticipating the release of it’s sequel? Tell me all about it via the comments section below! Tricia Levenseller writes historical fantasies for young adult readers. 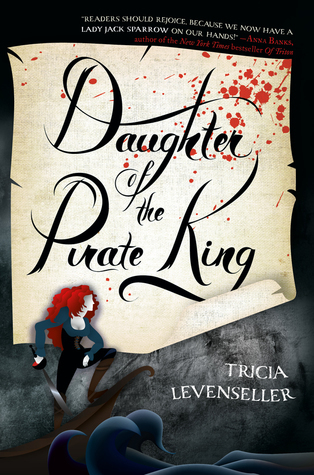 Her debut, Daughter of The Pirate King, released earlier this year from Feiwel and Friends, an imprint of Macmillan Publishers. Thank you for sharing your thoughts. I read this last year and I loved it too!